NOTE: This content is old - Published: Friday, Oct 13th, 2017. 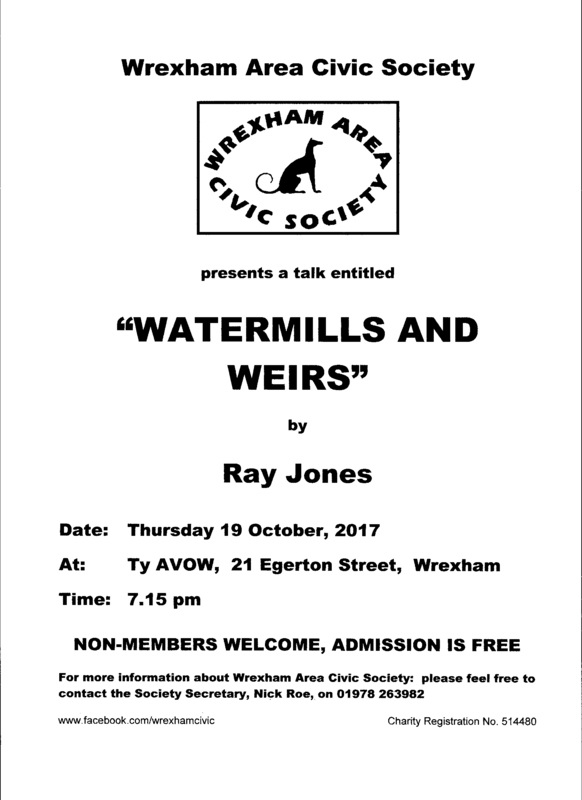 “WATERMILLS AND WEIRS” is the topic of a talk to be presented at a meeting of the Wrexham Area Civic Society. The speaker is to be Ray Jones. The meeting will take place on Thursday 19th October 2017 at Ty AVOW, 21 Egerton Street, Wrexham at 7.15 pm, until about 9.00 pm. All are welcome, admission is free. The Society will be pleased to welcome you. Ray will be discussing the historic watermills in North East Wales, and their input upon local communities and on the landscape of the areas in which they are located. Most of the examples to be used (and no doubt well illustrated) will be from the Wrexham area.